Are you delaying having your professional family portraits made because you feel now is just not the right time? The excuses may be you are too busy, you want to lose weight, your kids never sit still, your hair is not the perfect length, your child has braces, money is an issue, etc. Please keep in mind that your family will most likely care more about having the portraits as a keepsake later in life, than the fact that you didn't feel you looked perfect in the photos. To them, you are probably perfect just the way you are. Photos are a priceless way to remember life and document time over the course of many years, through many stages of life. Through the weight fluctuations, through the braces, through the bad hair cuts, through the awkward growth spurts of your kids, etc. Those stages are real life. I've had a few experiences over the years when someone in the family was experiencing a terminal illness and they wanted to capture one last memory together. And then there were the times when I did a family portrait session only to find out a few months later someone in the photo unexpectedly passed away. A member of one such family contacted me and told me how glad they were to have the photos to remember the loved one by. 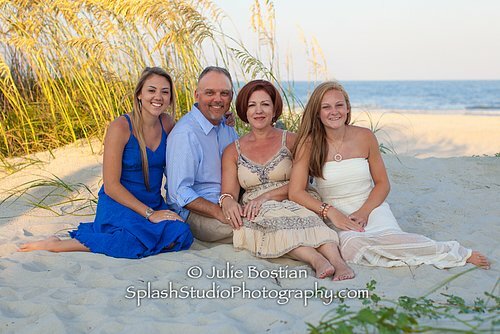 Below is a photo of my best friend and her beautiful family. Her husband, shown in the photo, suffered a heart attack in his early 40s about a year before this photo was taken. Thankfully, he recovered, and was able to be included in this family portrait session. The photo would be much different had he not survived the heart attack. YOU are worth the investment. YOU mean the world to somebody. So, what are you waiting for? Kids grow up quickly. Life is short. Celebrate life. Book your portrait session today. Get started here.